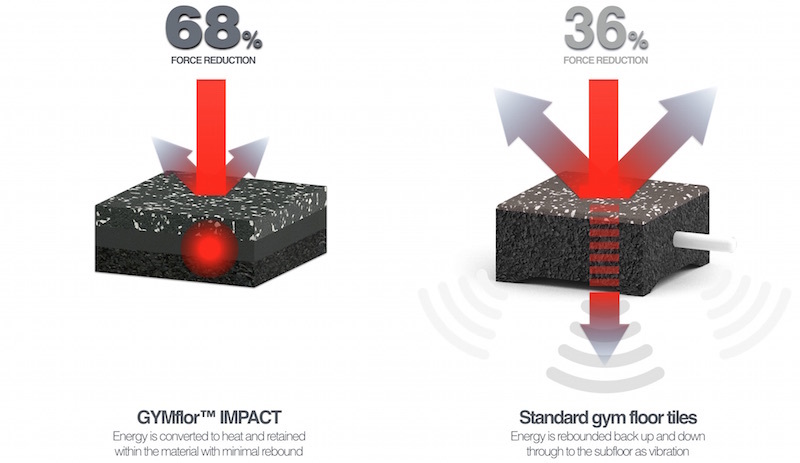 GYMflor™ IMPACT provides the ideal solution to protecting and maintaining the subfloor. World leading material technology provides up to 68% reduction in force from impact, reducing vibration caused by dropping heavy weights while also providing outstanding impact noise dampening. The high impact protection properties makes this an ideal surface for dumbbell and free weights training areas. GYMflor™ flooring is made from top-quality rubber and foam materials and is ideally suited to a wide range of applications from High Performance sports training facilities, to Crossfit Boxes, commercial gyms and fitness centres. GYMflor™ uses similar materials and technology to that used in ESP’s world renown TOTALPOWER™ Lifting Platforms by providing exceptional protection to the floor substructure with excellent noise and vibration reduction. GYMflor™ materials are sourced from all over the world to provide excellent durability and high resistance to mechanical wear. GYMflor™ RUN has been developed specifically for indoor sports training areas with excellent impact dampening and stability control for protection of joints while performing speed, agility and jumping exercises. GYMflor™ RUN can be flush-fitted level with the surrounding floor to transform the training facility into a safe and versatile functional training environment. Ideal for a wide range of facilities from school gyms to performance training centres. 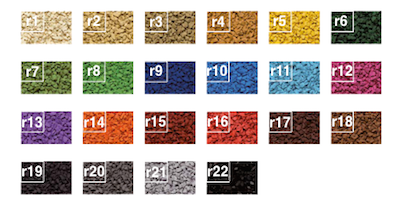 The 100 % compressed EPDM ­rubber with a selection of uniform colours allows for the application of high-contrast lines and can be fitted flush with the surrounding flooring. The density of the lanes can be tailored to any specific softness required. 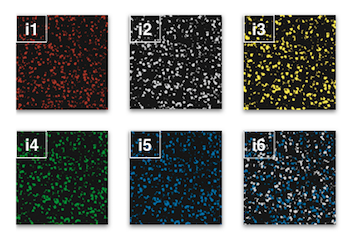 ESP’s GYMflor™ range of professional floor markings are distinctively creative yet bold and intuitively visable. All flooring can be branded with line markings, agility drill markings and logos. Our extensive range of functional markings are ideally suited for a variety of skills and drills. GYMflor™ TURF can be integrated into any training environment to create a versatile and functional space. The 4G turf technology with triple density nylon cushioned pile provides real grass feel with a high cushioning shock pad for added comfort. The thickness of the underlay shock pad can be adjusted to cater for varying degrees of impact absorption. GYMflor™ TURF can be fitted flush with the surrounding floor surface creating a safe, flat training environment. Ideal for the pushing and pulling of prowlers and sleds, power training, functional drills, group ‘cross-fit’ and ‘boot-camp’ training, and stretching, Yoga or rehabilitation exercises. GYMflor™ ASTRO is also available in the ESP GYMflor™ range and offers an economical yet durable artificial grass carpeting, creating a functional training space within your facility. Made from needle punch polypropylene, the surface can be vacuum cleaned in dry locations or hosed clean in external situations for a clean and tidy training environment. GYMflor™ DANCE offers a light and airy aesthetic touch to any studio space. The impact dampening and vibration control properties protects the spine and joints during high impact activities, providing a highly effective group fitness flooring solution. Ideal for any studio space activity including dance, Pilates, Zumba, BodyPump, Yoga and many more. With maximum hygiene in mind, GYMflor™ Dance is treated with a bacteriostatic and fungistatic treatment perfect for high traffic group fitness studios and classes. The triple action Protecsol® surface treatment provides for easy maintenance, cleaning and friction protection. GYMflor™ STRETCH is a superior shock absorption flooring system that comfortably moulds to the body for stretching, Pilates, Yoga and other mat based exercises. Create a comfortable relaxing zone within your facility with this non-PVC content floor that does not absorb moisture or odours. The soft and durable flooring can be fitted flush with the surrounding floor surfaces and provides a comfortable interface between ones body and the floor. 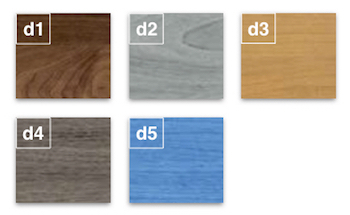 GYMflor™ STRETCH is available in a range of vibrant colours. ESP is partnered with leading fitness equipment financing institutions, to provide our clients with affordable tailored finance leasing to suit individual needs.